TORONTO NYE 2018/2019 Countdown Gala Celebration!3PARTY,EVENT,LIMO BUSES BETWEEN BARS – DOWNTOWN TORONTO New Years EVENT A PARTY LIKE NO OTHER! 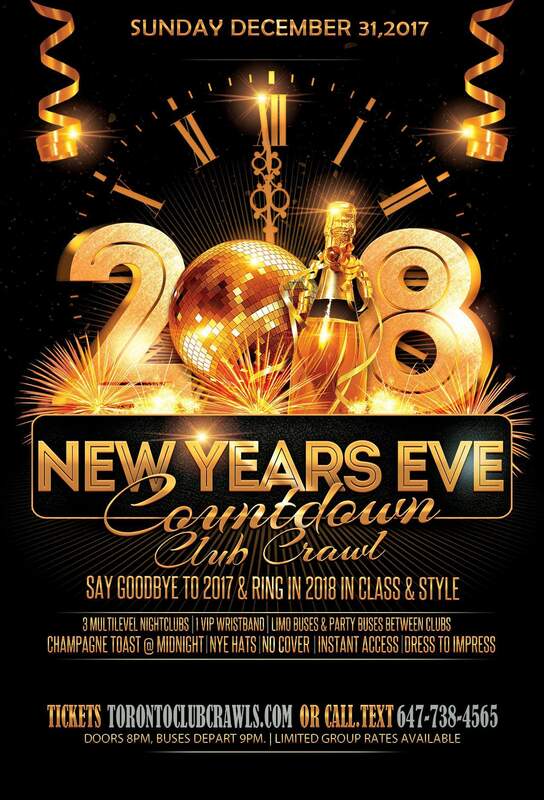 This New Years Eve get ready and join us as we present to you the 2018/2019 Countdown New Years Eve Club Crawl. Party at 3 of Toronto’s hottest nightclub venues in downtown Toronto as we say goodbye to 2017 and ring in 2019 with thousands of people in style as we countdown the final hours! Celebrate NYE in style at the top events & parties Toronto has to offer where all cover & transportation is included in one ticket price! Forget waiting in line, welcome to the 2018 NYE COUNTDOWN CLUB CRAWL! Your VIP Wristband gives you exclusive no line & no cover! Its New Years Eve! Why party at one celebration when you can party at 3 of the top nightclubs. We will follow as a group to 3 locations. Limited group rates available. How Does It Work: 1. Purchase your tickets online using any major credit card or VISA Debit 2. Pick up your wristbands on the date of the event from your starting destination 3. When its time to depart each venue, announcements will be made to board the limo buses as it guides you to each venue until the last stop has been reached 4. Enjoy the countdown to 2018 as it will be something like you never seen before! All nightclubs will be located in the downtown core. You will be transported between each nightclub starting at 9PM from your starting destination. At 9PM board the wildest buses in the city as it guides you club to club until the last stop is reached. *All tickets purchased online will be emailed right after purchase. No tickets are shipped. Tickets/VIP Wristbands will be available at the starting location on December 31st until 8pm only threw event organizers and 10pm at second location. Tickets may be presented on your mobile device or by printing them. Q- Where would everyone meet up? A-Everyone will meet at Grace O Malleys in downtown Toronto! This will be your starting point to meet the group, pick up your wristbands and dance to your top tunes as guest DJ’s rock the house until its time to depart! Q- What time to buses depart? A- Buses will start to depart outside your first destination starting at 9PM and make its way across the downtown core- Queen St, King Street, Pearl St.
Q- How Does this actually work? A- Once you have received your wristbands you will get VIP treatment at 3 venues. Simply show your wristband at the venue and you will get no cover, no line during the club crawl by following various hosts. We will follow as a group to 3 downtown venues. Our super fun party hosts will lead the way to the different locations and limo bus/party bus ticket holders will have bus transportation between 3 venues starting at 830pm. We will make our way to 3 selected venues. WRISTBANDS ARE ONLY VALID FOR THE CLUB CRAWL ONLY. Q- What time will I be able to get my Wristbands? A. Wristbands will be given out on December 31 from 730PM-9PM at your first stop and until 10PM at your second stop. Q- How long do we stay at each location? A- Each location will be 1hr 30mins and your last stop will be until close which is 3am. Q- Is there more than 1 bus? A- Yes! There will be tons of buses to transport everyone. Each limo bus hold 50 people and every party bus holds 60 people. Limo buses will be different from party buses. Limo buses feature surround sound, LED lights, poles, dance floor and more. A shuttle will run between the last venue we departed from just in case you missed the bus! Q- Can we order bottle service? A- Yes, call/text 647-738-4565 for bottle service packages. Booths must be reserved in advance. Q- Whats the difference between limo bus and party bus? A- Limo buses will feature LED lights, poles, dance floors, leather seating, surround sound and live photographer on each bus. Limo buses will be the buses you see under LIMO BUS photos. Party bus will be a regular bus that holds 60 people. Q- What if I can’t make it to the 1st location to pick up my wristbands? A- We recommend everyone to arrive at the main stop if you can’t make it please send someone to pick up your wristbands and you can meet them at their current location to join the party where you can join from there. Wristbands may also be picked up until 10pm at your second location. Q- How do we know when to go to the next location? Q- Whats the difference between VIP Limo Party bus & party bus tickets? A- VIP Limo Party bus simply gives you VIP transportation without walking and arriving at each location in style in various limo buses . Limo buses feature LED lights dance floor, surround sound, photographer on the bus. Party buses will be different from limo buses. Party buses will be a regular party bus. Limo buses hold 50 people each bus and party bus holds 60.